Black flowers in the garden provide a moody counterpoint to vibrant hot-hued blooms and dreamy pastels. No living flower is truly jet black; rather, the petals are such a deep shade of maroon, purple, or blue that they appear black. The slightest hint of wine or purple at a flower's edge adds depth and dimension to black blooms, and make them easier to blend in garden designs than a licorice-black flower. While the sun needs of black flowers vary by species, most black flowers look their best in at least some partial sun. A black flower that grows in the shadows just appears to be another shadow. 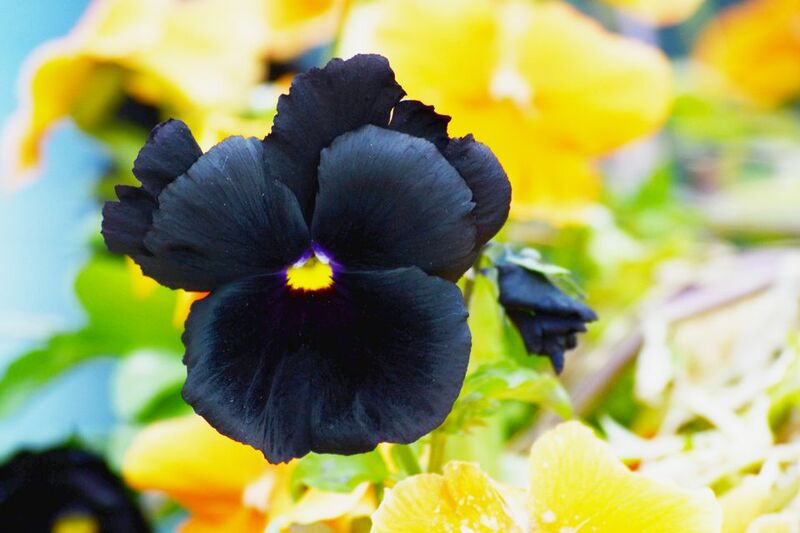 Plant your black flowers in front of a backdrop of neon green foliage, bright orange blossoms, or bright white blooms, and master the latest color trend in the garden. 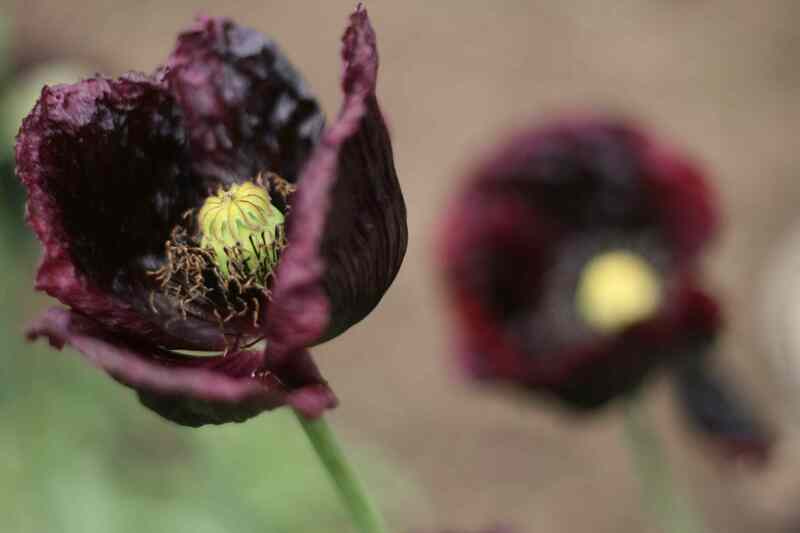 The 'Midnight' poppy has all of the mystique of other Oriental poppies, with juicy raisin-toned petals that dazzle on 30-inch stems. The bright green seed capsule surrounded by a frizz of white-tipped stamens serves as a focal point on each bloom. Unlike many hybrid flowers, 'Midnight' poppies are available as seed, which means anyone can afford to plant a large stand of these impressive spring bloomers. Like all Oriental poppies, 'Midnight' poppy plants produce a deep taproot, and resent transplanting. Site them in a sunny area with loose, sandy soil for the best performance. When the blooming is over, you can leave the conspicuous seedpods standing, and then cut them back to the basal rosette of foliage. Pansies are extremely freeze-hardy annual plants, which offers a stunning design possibility for those who grow the 'Black Beauty' pansy: Can you imagine a gathering of these brooding black blooms nestled between drifts of gleaming white snow? Pansies will even survive a hard freeze, so plant them with abandon up to three months before the last frost in your area, as soon as the garden center makes them available. The bright yellow center of the petals adds a touch of distinction to each flower, and look fantastic when planted with a companion of yellow pansies with purple blotch faces. Hollyhocks make a bold statement in any garden, but 'Nigra' hollyhocks look almost otherworldly, with their waxy onyx petals held aloft on five-foot stems. The creamy blossom centers seem to act as a landing pad for all types of bees, which adore the flowers and depend on them as a nectar source in the garden. The 'Nigra' hollyhock is an heirloom dating back to the 17th century, a testament to its vigor. The seven-foot stalks are so floriferous that staking may be necessary to keep them upright. The bearded iris is a spring perennial garden staple. Exotic flowers on hardy plants that require little care other than a renewing division every few years will reward beginning gardeners in zones 3 through 10 in April and May. 'Old Black Magic' is classified as a self-style of bearded iris, which means the standards and falls are the same color; in this case, a delicious raven black that shimmers in the sun. A golden orange beard punctuates each bloom in the center. Both petals and pollen anthers of the 'Black Charm' lily are the same ink-like tone, setting hearts aflutter with trumpet-shaped blooms on 36-inch stems in early summer. The deep maroon hue looks divine paired with the cultivar 'Patricia's Pride,' which has cream-colored petals with a maroon center. All Asiatic lilies benefit from deep planting to help them return each year, so dig those holes at least six inches deep. Another heirloom favorite introduced in 1944, 'Queen of Night' tulips are truly a plant-it-and-forget-it flower. One of the later tulips to bloom, you can expect to see the flowers appear on 22-inch stalks in mid-May. Spring bulbs like tulips look best when planted en masse. Buy a bag of at least 12, and mix them with a complimentary color like white or lavender. Make sure to take note of the blooming time of any complimentary tulips you plant, looking for the words "late tulip" in the product description. Don't forget your houseplants when shopping for black blooms. In addition to its mysterious sooty hue, the bat flower (Tacca chantrieri) puts its full personality on display with cat-shaped flowers that even bear unusual whisker-like growths known as filamentous bracteoles. Give your bat plant a humid, warm spot with partial sun in your home. Calla lilies thrive in hot, humid areas, and will grow quickly to form a focal point in your summer container garden. The 'Black Forest' cultivar sports midnight blooms with a hint of reddish-wine on the rim, which might help its appeal to hummingbirds. The South African natives will bloom from mid-summer until frost, and must be overwintered indoors where temperatures drop below freezing. As a very early spring bloomer, hellebores like 'New York Night' fill a niche in the garden when not much else is going on. Plants are evergreen, and tolerate that tough dry shade zone where little else can thrive. However, if you give your hellebores a little love with some compost and regular irrigation, they will love you in return with a crop of baby plants the following spring, yielding a handsome little colony of black plum flowers for the vase.